Berries, avocado, banana, chia seeds and acai powder... Mmmh... Sounds like a good smoothie to me. Just throw everything in a blender and blend it up for about 2 minutes, so it's nice and smooth. Avocado is normally not a fruit you gravitate towards in smoothies, but it's amazing at making your smoothie really smooth and creamy, without adding any additional milk. Avocados are a good source of healthy fats, fiber and all kinds of vitamins. Chia seeds are tiny little seeds that honestly taste like nothing, but these little guys contain tons of Omega-3 fatty acids, protein and fiber, which is great for your skin, bones and generally your body. I also add these to my yogurt or juice to give it some extra health benefits. These also make you feel full throughout the day. Acai powder comes from the Acai berry, which is a dark purple tropical berry, found in Central and South America. Acai contains Omega fatty acids, antioxidants, protein and fiber. Like the chia seeds, this is going to make you feel full throughout the day and it's an all over amazing product for your body and immune system. Some studies even apply that this will help you loose weight, so why wouldn't you want to add this to your smoothie? 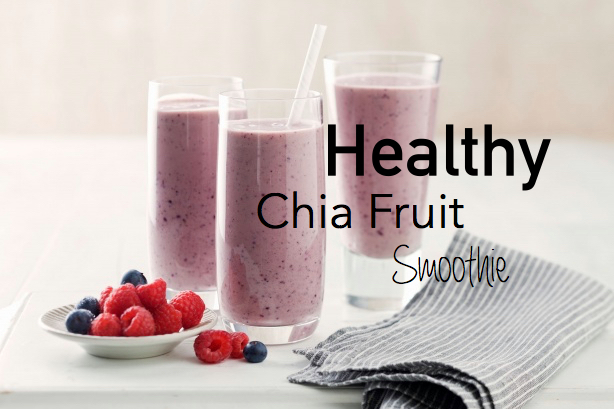 Enjoy this delicious and nutritious fruit smoothie!